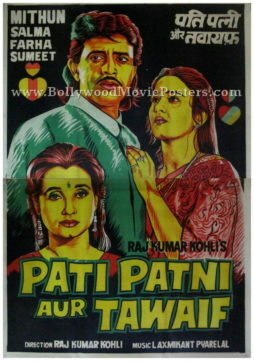 Vintage Bollywood film poster for sale of the old Hindi movie, Pati Patni Aur Tawaif (1990). This is an actual surviving old Bollywood film poster for sale of the 1990 Hindi film directed by Rajkumar Kohli, starring Mithun Chakraborty, Salma Agha, Farha Naaz and Om Prakash in pivotal roles. Pati Patni Aur Tawaif was based on Premchand’s novel Bazaar-e-Husn. Printed and circulated during the initial run of the film (early 1990s), this rare hand painted Bollywood poster was designed and printed for publicity of the film but never ended up being used. Originally designed in hand painted oil on canvas format by an art studio in Kolkata, this vintage Bollywood film poster features quirky hand drawn renditions of the lead characters of the film. Mithun Chakraborty and Farha Naaz are seen in a stunning rendition on the top of this vintage Bollywood film poster. Salma Agha, who essays the role of a prostitute in the film, is seen at the bottom. This vintage Bollywood film poster is a two sheeter. Two sheet posters comprise two separate individual single sheet posters measuring approximately 40″x30″ inches each. When pasted together they line up perfectly and together form one single two sheet poster. In the image provided, there may be a slight gap visible between the two – as the images of the top and bottom half have been photographed individually and then joined together digitally. When framed or pasted, there will be no gap visible between the two sheets and the appearance of the poster would be seamless – i.e. just like a single sheet poster. 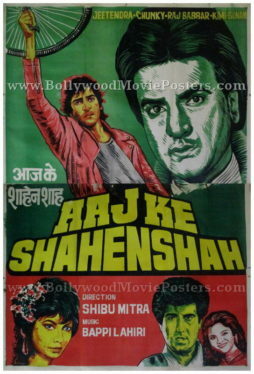 Vintage Bollywood film poster for sale of the old Hindi movie, Aaj Ke Shahenshah (1990). This is an actual surviving old Bollywood film poster for sale of the 1990 Hindi film directed by Shibu Mittra which starred Jeetendra, Chunky Pandey, Raj Babbar, Kimi Katkar and Sonam in pivotal roles. Printed and circulated during the initial run of the film (early 1990s), this rare hand painted Bollywood poster for sale was designed and printed for publicity of the film but never ended up being used. Originally designed in hand painted oil on canvas format by an art studio in Kolkata, this vintage Bollywood film poster features quirky hand drawn renditions of the lead characters of the film. A large close up portrait of actor Jeetendra is seen painted in green on the right of this vintage Bollywood film poster. Chunky Pandey is seen in a smaller avatar alongside. The bottom of this hand drawn poster shows smaller figures of Raj Babbar, Kimi Katkar and Sonam. Vintage Bollywood film poster for sale of the old Hindi movie Devi (1970). 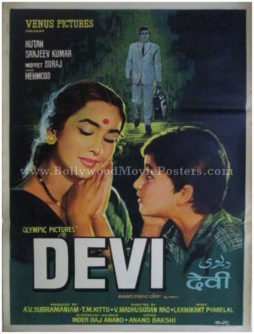 This is an actual surviving vintage Bollywood film poster of the 1970 movie Devi, which starred Nutan, Sanjeev Kumar & Mehmood in prominent roles. Printed and circulated during the original first release of the film (somewhere in the late 1960s / early 1970s), this vintage Bollywood film poster for sale was printed for publicity of the film but never ended up being used. This vintage Indian film poster was originally designed in hand painted oil on canvas format by master Bollywood poster designer V.G. Parchure, making it highly collectible. The printed signature of movie poster designer V.G. Parchure in the name of his art studio Pamart is seen on the bottom right of this vintage Hindi film poster. A stunning rendition of lead actress Nutan with a child is seen prominently in a large close up portrait in this vintage Indian film poster. A smaller full size photograph of actor Sanjeev Kumar is seen at the center of this vintage Hindi film poster for sale. Hand painted Bollywood poster of the old Hindi film, Mela (1948) for sale. This is an actual surviving hand painted Bollywood movie poster of the 1948 romantic tragedy that starred the Tragedy King of Bollywood, superstar Dilip Kumar in the lead role. Produced by Wadia Movietone, the film also starred Nargis, Jeevan Rehman and Nur Jehan. Printed and circulated somewhere in the 1950s, this vintage Bollywood film poster was printed for publicity of the film but never ended up being used. This vintage Bollywood film poster was originally created on canvas by an art studio in Kolkata, giving it a very quirky appearance. Superstar Dilip Kumar and actress Nargis are seen in large close up portraits painted prominently in the poster, in a Simpsons-like yellow avatar. Actor Jeevan who essays a villainous role in the film, is seen hand drawn in black and white at the bottom in a smaller portrait. A carnival is seen as a suggestion at the bottom of this vintage Bollywood film poster for sale. The combination of yellow and red used in this vintage Bollywood film poster gives it a very appealing and eye catching appearance. The line drawing techniques used in the past by old school Bollywood poster painters is very evident in this vintage Bollywood film poster for sale. 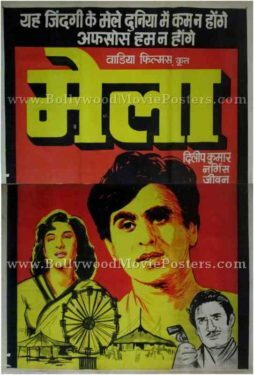 The music of Mela played a pivotal role in its commercial success at the box office and the film was touted as “Naushad’s Golden Jubilee Mela.” Capitalizing on the same, this vintage Bollywood film poster reads out the lyrics of a popular song from the film on the top, “Ye Zindagi Ke Mele Duniya Mein Kam Na Honge; Afsos Hum Na Honge” sung by Mohammed Rafi. 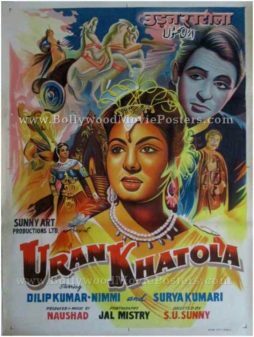 Vintage Bollywood film poster for sale of the old Hindi film, Uran Khatola (1955). This is an actual surviving vintage Bollywood film poster of the 1955 classic produced by music director Naushad, which starred the ultimate method actor of Bollywood, Dilip Kumar in the lead role. Printed and circulated somewhere in the late 1950s, this vintage Bollywood film poster was originally designed for publicity of the film but never ended up being used. This vintage movie poster is a stunning example of hand painted Bollywood film poster art. The use of vibrant colors and artistic flair (evident in the visible brush strokes) give this vintage Bollywood film poster a stunning appearance. Large quirky hand painted renditions of lead actors Dilip Kumar and Nimmi are seen prominently in this vintage Bollywood film poster. Uran Khatola is a 1955 Bollywood movie produced by music director Naushad (who also composed music for the film), starring Dilip Kumar and Nimmi in lead roles. Although the film itself was not a box office success, its music is fondly remembered till today. 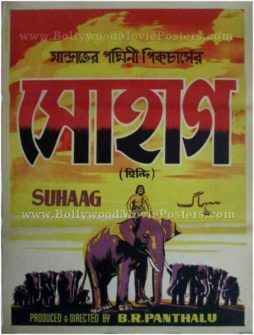 Hand painted vintage Bollywood film poster for sale of the Hindi movie Suhag (1958). This is an actual surviving vintage Bollywood film poster for sale of the 1958 film Suhag, which starred two of the biggest stars in Tamil cinema, Sivaji Ganesan and Gemini Ganesan in prominent roles. Directed by B. R. Panthulu, the film starred M.V. Rajamma in the lead role. Printed and circulated during the original first release of the film (somewhere in the late 1950s), this vintage Bollywood film poster for sale was printed for publicity of the film but never ended up being used. This vintage Bollywood film poster was originally designed in hand painted oil on canvas format by a leading poster design studio in Madras, making it highly collectible. This vintage poster is a classic example of Bollywood film poster art. The artwork is minimal yet appealing. A brilliant hand painted rendition of a man on an elephant is seen prominently in this hand painted vintage Bollywood film poster. Suhag featured two of the biggest superstars of Tamil cinema together on screen – the “King of Romance” Gemini Ganesan and “The Marlon Brando of Indian Cinema” Sivaji Ganesan. Original Bollywood film poster for sale of the hit Hindi film Tarana (1951). 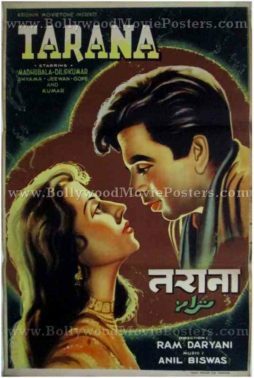 This is an actual surviving vintage Bollywood film poster for sale of the 1951 film Tarana which starred the ultimate method actor in Bollywood, Dilip Kumar in the lead role opposite the “Marilyn Monroe of Bollywood,” Madhubala. Tarana was the first film to star superstars Dilip Kumar and Madhubala together, making this old Bollywood film poster highly collectible! The legendary romance between Dilip Kumar and Madhubala began on the sets of Tarana (1951) when the two superstars were shooting together for the first time. The fairytale romance between the two finally ended on the sets of Naya Daur (1957). Printed and circulated during the original first release of the film (somewhere in the 1950s), this vintage Bollywood film poster for sale was printed for publicity of the movie but never ended up being used. This vintage Bollywood film poster for sale was originally designed in hand painted oil on canvas format by a leading poster design studio, making it highly collectible. Dilip Kumar and Madhubala are seen locked in a passionate gaze prominently in the poster. Both portraits are stunningly hand painted, with highlights added to the faces as well as hairlines, making them stand out prominently. The two lead actors are encased inside a heart, which completes the romantic theme of this vintage Bollywood film poster for sale. Tarana is remembered for its music composed by the pioneer of Indian orchestra music in Hindi cinema, Anil Biswas. Tracks like the popular duet sung by Talat Mehmood and Lata Mangeshkar, “Seene Mein Sulagte Hain Armaan” are fondly remembered and played till today. 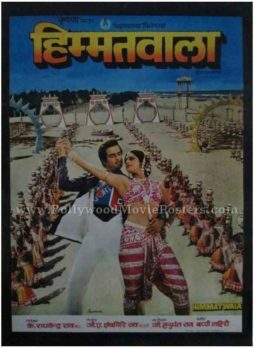 Vintage Indian film poster of the blockbuster Bollywood movie Himmatwala (1983) for sale. This is an actual surviving original Bollywood film poster of the 1983 Hindi film that catapulted actress Sridevi into Bollywood stardom. Printed and circulated during the initial first release of the film (somewhere in the early 1980s), this vintage Hindi film poster was originally designed for publicity of the film but never ended up being used. This fabulous vintage Indian film poster contains a stunning still photograph taken from the iconic song in the film “Nainon Mein Sapna.” Jeetendra and Sridevi are seen in a dancing pose prominently in the center. A striking array of backup dancers is seen in the background of this original Bollywood film poster. The entire poster is encased in a solid black border. Himmatwala (The Brave) is a 1983 action Hindi film starring Jeetendra and Sridevi. The film is credited with turning actress Sridevi into a star in Hindi cinema. The film was the highest grosser of the year it was released in and declared a blockbuster. A couple of songs from the film composed by Bappi Lahiri became hugely popular – “Nainon Mein Sapna” (sung by Kishore Kumar & Lata Mangeshkar) and “Taki O Taki” ( sung by Kishore Kumar & Asha Bhosle). Inspired by the huge success of the film in 1983, Sajid Khan directed a recent remake of the film starring Ajay Devgan. The remake however, released in the year 2013, was a disaster at the box office. Old Bollywood poster of the classic Hindi blockbuster, Disco Dancer (1982 ) for sale. 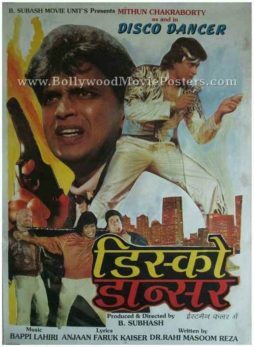 This is an actual surviving old Hindi movie poster of the 1982 Bollywood hit starring Mithun Chakraborty in the lead role. Disco Dancer was a worldwide success. The film became an overnight sensation in the Soviet Union owing largely to its memorable music composed by Bappi Lahiri and Mithun Chakraborty’s signature disco dance moves. Songs from the film such as “Jimmy Jimmy Aaja Aaja” and “I Am a Disco Dancer” are still fondly remembered and played in Russia. Printed and circulated a few years after the first release run of the film (late 1980s), this retro Bollywood movie poster was originally designed for publicity of the film but never ended up being used. 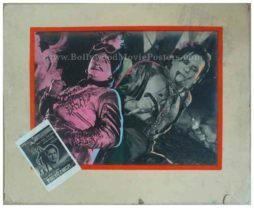 Old Bollywood movie showcard of the Fearless Nadia Hindi film, Shamsheer Baaz (1953) for sale. This is an actual surviving vintage Bollywood showcard of the 1953 film that starred Mary Evans, better known as “Fearless Nadia” or “Nadia Hunterwali” in the lead role. Printed and circulated during the first release of the film (somewhere in the early 1950s), this old Bollywood showcard was designed and printed for publicity of the film inside a cinema hall. Showcards were used as pin ups on notice boards inside foyers of cinema halls. Printed on photo paper, they were often mounted on cardboard to make them easy to display. This rare surviving showcard was actually issued to a cinema hall that screened the film Shamsheer Baaz, making it highly collectible! This old Bollywood showcard features stunning hand colored artwork. Black and white still photographs have been pasted on a board and actually hand colored by an artist. The blue outline and highlights seen in this showcard have been done by hand by a poster artist in the early 1950s. A black and white miniature poster of the film is seen pasted on the bottom corner of this hand painted Bollywood showcard. Shamsheer Baaz is one of Fearless Nadia’s memorable action packed Bollywood films. Born in Australia, Fearless Nadia was one of the earliest actresses in Indian cinema to star in lead (primarily women-oriented action-packed) roles. In her illustrious career, Fearless Nadia starred in dozens of films produced and directed by Homi Wadia, starting from her debut in the film Hunterwali (1935). 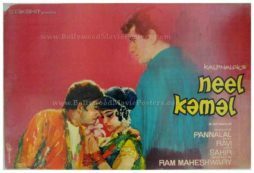 Old Bollywood movie showcard of the Hindi film, Neel Kamal (1968) for sale. This is an actual surviving vintage Bollywood showcard of the 1968 film that starred actress Waheeda Rehman in the lead role. Printed and circulated during the first release of the film (somewhere in the late 1960s), this old Bollywood showcard was designed and printed for publicity of the film inside a cinema hall. Showcards were used as pin ups on notice boards inside foyers of cinema halls. Printed on photo paper, they were often mounted on cardboard to make them easy to display. This rare surviving showcard was actually issued to a cinema hall that screened the film Neel Kamal, making it highly collectible! This old Bollywood showcard features stunning hand painted artwork. Originally designed by the greatest and most expensive Bollywood poster artist of all time, Diwakar Karkare (owner of Studio Diwakar), this beautiful hand painted showcard displays his signature flair and mastery over the paint brush. Bollywood poster painter Diwakar’s printed signature is seen on the bottom left of this old Bollywood showcard. Actor Manoj Kumar is seen in a large portrait on the right, with visible brush strokes giving an effect of dripping paint on a canvas board. Waheeda Rehman and Raaj Kumar are seen in a romantic pose at the bottom, both hand painted in broad visible brush strokes giving this old Bollywood showcard a very artistic feel. 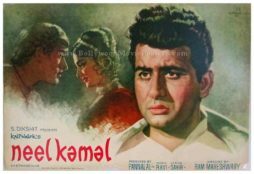 Neel Kamal is a 1968 Bollywood movie starring Waheeda Rehman, Raaj Kumar and Manoj Kumar in prominent roles. This old Bollywood showcard features stunning hand painted artwork. Originally designed by one of the greatest and most sought after Bollywood poster painters of his time, DR Bhosle, this old hand painted showcard displays his signature style of stunning realism and simplicity. A large hand painted portrait of actor Manoj Kumar is seen prominently in the foreground. Waheeda Rehman and Raaj Kumar are seen in a romantic pose on the left. The printed signature of Bollywood poster artist DR Bhosle is seen on the top right hand corner of this old Bollywood showcard. Original old Bollywood movie poster of the Sridevi film, Maut Ki Ladai (1989) for sale. This is an actual surviving vintage Bollywood poster of the 1989 Hindi drama that starred the first female superstar of Bollywood, Sridevi in the lead role. Printed and circulated during the original first release of the film in the late 1980s, this old Sridevi film poster was printed for publicity of the film but never ended up being used. This old Sridevi film poster was originally designed using an interesting collage technique of using cutouts of still photographs. An interesting still photograph featuring Sridevi in a somewhat demure pose from the film is seen pasted prominently on the right hand side of the poster. Another large still photograph of actress Jayapradha is seen on the left of this old Sridevi film poster. 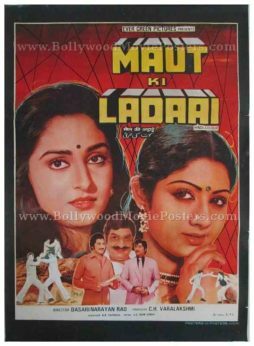 Maut Ki Ladai is a 1989 Bollywood drama starring Sridevi, Jayapradha and Krishna.